When I put together my new Surly Cross-Check earlier this year, I used a Shimano Tiagra rear derailer and a SRAM 11-28 9-speed cassette, just because that’s what I happened to have around. It’s got compact double (50/34-tooth) chainrings, and Shimano Tiagra integrated brake/shifter levers. During the first couple of rides, although the routes were rather hilly, I never felt like I didn’t have a low enough gear. However, it’s not always a matter of having a low enough gear, but being able to find the “right” gear. I always had plenty low enough gears on my road racing bike with a 12-27 cassette, and the combination of the standard double (53/39-tooth) chain rings seems to allow me to cruise along for long stretches in either the big ring or small ring as needed. The benefits of a compact double are having almost as low of a gear range as with triple chainrings, with the lower weight and better reliability of a double. I find myself having to switch between the small and big chain rings more often with a compact double, though, and the 11-28 cassette seemed to make this issue even worse. Looking through my spare parts, I had a SRAM 11-34 cassette, but no spare mountain rear derailer that could handle that large of a cassette. So, I turned to our store stock to see what I could buy that was a decent model at a reasonable price. In searching through 9-speed Shimano rear derailers, this oddity turned up: Deore LX RapidRise. The very definition of “new old stock.” Out of curiosity, I gave it a try. Shimano originally debuted their RapidRise rear derailers in the early 90’s, mainly for use on entry-level hybrid bikes. On a RapidRise rear derailer, the spring action is reversed, so that the “natural” position of the derailer is on the largest, i.e. easiest, cog. This is also referred to as “low normal.” This is as opposed to a “traditional,” or “top normal” rear derailer, where the natural position is on the smallest, or hardest cog. When you operate your right shifter with a traditional rear derailer, the shifter action that pulls the shifter cable pulls the derailer against the spring tension to a larger, easier cog. Clicking the shifter to release cable tension allows the spring tension to pull the derailer back to the smaller, harder cogs. 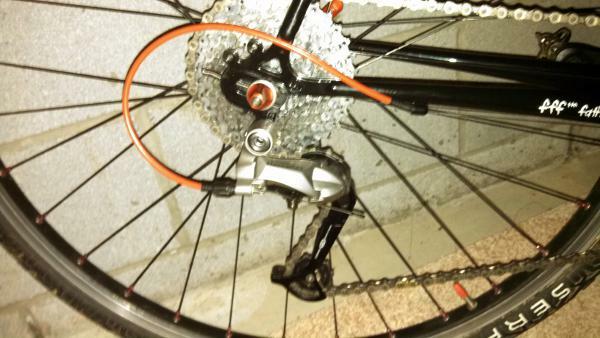 This action is reversed with a RapidRise rear derailer. So, back to the early ’90s, when RapidRise made its first appearance. I don’t know from experience, but I’m told that it never caught on because it was used mainly on entry-level bikes, and as such, the parts were entry-level quality, and just didn’t work all that well. Bike mechanics hated it, so they wouldn’t buy it, and wouldn’t sell it. Later, in the mid ’00s, RapidRise returned when Shimano developed Dual Control shifters for mountain bikes. 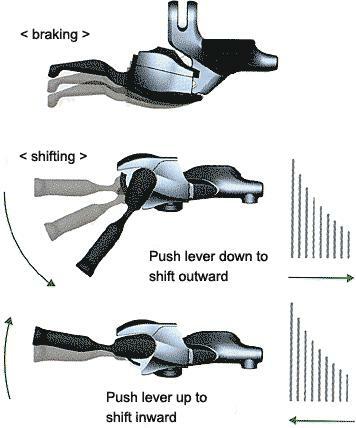 Without going into too much detail about how it worked, Dual Control was kind of like the mountain bike version of Shimano’s integrated road bike brake/shifter (STI) levers. 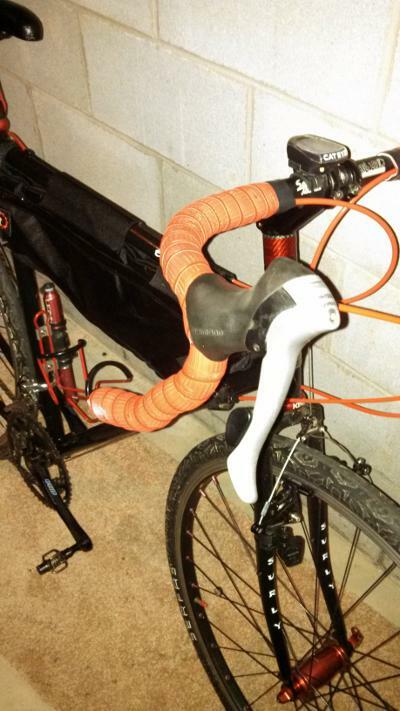 With the way Dual Control levers worked, it just kinda made sense to use a RapidRise rear derailer with them. For a couple of years, they made two versions of some of their derailers, a traditional (top-normal) version, and a RapidRise (low-normal) version. And these were nice derailers this time around–Deore, Deore LX, Deore XT, and XTR. Dual Control lever sets were available for hydraulic disc brakes and for cable-actuated brakes (linear-pull rim brakes or mechanical disc brakes). Alas, Dual Control never really caught on. I don’t know if it’s because riders just didn’t care for the way it worked, or because bike mechanics still had bad memories of RapidRise, and didn’t want to sell it. So, with the death of Dual Control came the second death of RapidRise. Back to 2013 and my Surly Cross-Check and Shimano Deore LX RapidRise rear derailer. The installation and setup was a snap; I just put the chain in the largest cog, attached the derailer cable to the derailer’s pinch bolt, then fine-tuned the cable tension as needed. I had to add a link to my chain to allow for the longer derailer cage of the Deore LX compared to the Tiagra rear derailer. Unless you shifted the bike, you wouldn’t know it was any different by looking at it. Out on the road, it works like a champ. It didn’t take me very long to get used to the opposite shifting action on my right hand. Down-shifts while climbing are much easier, and I think this is where the average rider needs their down-shifts to be easier. There are only two possible downsides to this setup that I can see. One is that you can’t down-shift multiple gears at a time with one sweep of the lever (although you can up-shift multiple gears this way). The second is that with up-shifting being just a tad less responsive, this could be a detriment in sudden chase or sprint situations. However, this not being a race bike, neither of these issues are of any concern to me. If this all sounds like a great idea to you, then I’m sorry, but your local bike shop isn’t likely to have many RapidRise rear derailers sitting around, if any at all. The next evolution in bicycle drive train technology is Shimano’s Di2 electronic shifting systems for road bikes. The latest versions allow you to re-program the shift buttons to customize them however you like, so you could mimic the shifting functionality that I’ve described with my setup by swapping the up-shift and down-shift buttons. You can program the buttons to shift multiple gears in either direction. You can even swap the left- and right-hand shifting if you want. I suspect that this technology will move to the mountain bike world in the next couple of years.